I actually stuck to my meal plan fairly well last week. Let's see if I can do as well this week! Tuesday: Tuna Melts (On English Muffins) with Sweet Potato Fries (Mmmm), Veggies and Fruit. Saturday: Cinco de Mayo Fiesta! Fajitas, Salsa Pico de Gallo, Guacamole, Tortilla Chips, Dulce de Leche Ice Cream, Mexican Celebration Cookies and Mexican Flag Cookies (from our Spanish lessons). The Ginger Beef recipe and a couple of the Spanish recipes are from The International Cookbook for Kids, a wonderful collection of recipes from Italy, China, Mexico, and France. Levi and I savored this entertaining book about the four Melendy siblings. The children live in New York City with their father and their housekeeper, Cuffy. Mona is thirteen, Rush is twelve, and Miranda (always called Randy) is ten-and-a-half. Oliver is the baby at just six years old. The book was originally published in 1941. The Saturdays is the first of the four books Elizabeth Enright wrote about the Melendy children and tells the story of their Independent Saturday Afternoon Adventure Club (I.S.A.A.C.). I was once again amazed at the independence, responsibility, resourcefulness, creativity, camaraderie, and knowledge displayed by children of this era. While I am completely aware that this is a fictional novel, the times have definitely changed. The three older children all ventured out into the city, one at a time. Randy (the artist and dancer) went to an art show, Rush (the musician) took in an opera, and Mona (an aspiring actress) had her hair done by a hairdresser with a villainous smile. She compared him to Iago, and I am happy to say that I actually caught that Shakespearean reference thanks to my educational efforts this year. The Saturdays made me want to relive my childhood, and Enright captures the essence of what I want for my own children. I hope we will have a chance to read the following three books in the future. Our list could have been much longer, but we never would have gotten any reading done! Semicolon hosts the Saturday Review of Books today. Feel free to read the reviews or join in with your own. 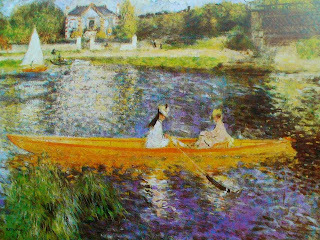 During nap-time reading this week, Luke and I chose Sharing with Renoir. When we reached this painting I just wanted to jump in. I am partial to impressionist paintings to begin with, but gazing at this painting...I felt carried away. There is something timeless about it. I can practically feel the cool blue water, the light breeze, the soft sunshine. I want to pack a picnic lunch and my current read and float all day. Maybe after a few hours, I would meander up to the terrace and have tea and scones. Possibly chocolate dipped strawberries. Care to join me? Keeping in mind that 'the best-laid plans of mice and men often go awry,' (or, The best laid schemes o’ mice an’ men / Gang aft a-gley. Robert Burns in "To a Mouse.") I have spent some time writing out our basic plans and resources for the next few years. Following are plans for Levi's kindergarten this year. I will post a progress report in the middle of the year. Math: (continue with) RightStart Math (Text, Worksheets, Manipulatives, and Games)-- 2-3 lessons weekly (often taking 2 days to complete a lesson). Writing: (continue with) Handwriting Without Tears (Teacher's Guide and Student Workbook)-- 4 lessons weekly. Use blank HWT lined paper for copywork when finished with all lessons. Phonics: (continue with) The Ordinary Parents' Guide to Teaching Reading-- 2-3 lessons weekly. Supplement with Nora Gaydos readers and other first readers, sight-words flash cards, phonics games, Leap Frog Word Factory videos, Between the Lions (on PBS). Bible: 5 Minute Devotions for Children, The Children's Illustrated Bible, Big Truths for Little Kids, (various picture books, Sunday school), Wee Sing Bible Songs, Sing the Word from A to Z (26 Bible verses in song...memorize all by end of year), memorize The Lord's Prayer and other children's prayers. Literature: Read-aloud chapter books (Wind in the Willows, Pippi Longstocking, The Saturdays, The Cricket in Times Square, The Twenty-One Balloons, Ben and Me, The Borrowers, Winnie the Pooh, Little House in the Big Woods, The Moffats, Heidi, The Hundred Dresses, and more). Books and stories on CD (Jim Weiss story CDs, Classic Stories for Children, Narnia series, Just So Stories, Beatrix Potter stories...) and many picture books. (Make vocabulary lists with new words found in read-alouds.) (We have also read 3 children's versions of Shakespeare plays and then watched live performances of each this year.) Library visits. Grammar: First Language Lessons (begin in September). History: Explore U. S. History using books, games, movies, and more. Read The American Story: 100 True Tales from American History. Read through A Pioneer Sampler: The Daily Life of a Pioneer Family in 1840. Complete included activities. (Read Little House in the Big Woods when finished.) Celebrate and learn about holidays such as Flag Day, Presidents Day, Thanksgiving, and Columbus Day. Start recognizing presidents. Memorize The Preamble to the Constitution, the Statue of Liberty poem, The Pledge of Allegiance, The Star Spangled Banner, God Bless America, America the Beautiful, and other patriotic songs, poems or quotes. Geography: Start learning about the United States (locating individual states) using maps, games, books, puzzles, and other resources. Art Appreciation: Read books about artists, games (from How to Use Child-Sized Masterpieces), visit art museum. Music: Listen!! (Classical Kids series, The World's Very Best Opera for Kids, Jazz for Kids, Classic Songs for Kids, Dog Train (Rock-n-Roll), Peter and the Wolf, Beethoven's Wig, and other CDs. Ballet performances on DVD.) Watch The Little Einsteins (Disney Channel). Possibly add in piano lessons or music class at the music conservatory by fall. Attend concerts in the park during the summer. Current Events: Read God's World News magazine. General discussion. P.E. : Large quantities of outside time, bike riding, and fresh air. Family swim nights at the pool. Swimming lessons. Possibly add in Tae Kwon Do. I will post tentative plans for the rest of the 'grammar stage' in a future post. Our Homeschool. Part I. The Background Story. Our Homeschool. Part II. Why We Homeschool. Our Homeschool. Part III. Classical Education. 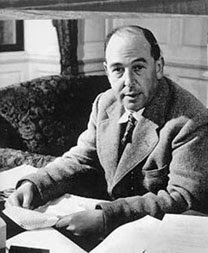 C. S. Lewis, more than any other author, has the ability to inspire me, challenge me, touch me. If I could meet one person from the 20th century, he would be the one. Intellectual, humble and down-to-earth, humorous, extremely well-read, imaginative--yes, that is my idea of a perfect dinner date! A Year With C.S. Lewis: Daily Readings from His Classic Works has been gracing my bedside table for a few months now. There is something about ending every day with a taste of Lewis. My love-affair with 'Jack' is only growing. (Grin.) The book includes passages from Mere Christianity, The Weight of Glory, The Screwtape Letters, The Problem of Pain and more. Each entry is less than a page long. Often a theme will be continued for a couple of 'days,' using continuous exerpts from one book or cross-referencing the theme from another book. However the passages are chosen, I find myself appreciating the humor, wisdom, or challenge at the end of a long day. The horror of the Same Old Thing is one of the most valuable passions we have produced in the human heart--an endless source of heresies in religion, folly in counsel, infidelity in marriage, and inconstancy in friendship. The humans live in time, and experience reality successively. To experience much of it, therefore, they must experience many different things; in other words, they must experience change. And since they need change, the Enemy (being a hedonist at heart) has made change pleasurable to them, just as He has made eating pleasurable. But since He does not wish them to make change, any more than eating, an end in itself, He has balanced the love of change in them by a love of permanence. He has contrived to gratify both tastes together in the very world He has made, by that union of change and permanence which we call Rhythm. He gives them the seasons, each season different yet every year the same, so that spring is always felt as a novelty yet always as the recurrence of an immemorial theme. He gives them in His Church a spiritual year; they change from a fast to a feast, but it is the same feast as before. Now just as we pick out and exaggerate the pleasure of eating to produce gluttony, so we pick out this natural pleasantness of change and twist it into a demand for absolute novelty. This demand is entirely our workmanship. If we neglect our duty, men will not only be contented but transported by the mixed novelty and familiarity of snowdrops this January, sunrise this morning, plum pudding this Christmas. Somehow, my affection for 'Jack' is now and forever intertwined with an affection for Anthony Hopkins. When I think of the one, I picture the other. So, while we are on the subject of Anthony Hopkins (we are, aren't we? ), I have to mention one other movie. Now, it seems almost sacrilegious to talk about a Brad Pitt movie in the same post as C. S. Lewis, not to mention that no one else seemed to like this movie (other than my sister, Shannon, who shares half my brain), but for some inexplicable reason....I loved Meet Joe Black. I thought it was beautiful and shining. Exquisite, even. Anthony Hopkins was wonderful as a man who had lived a strong, upright, blameless life. Claire Forlani was stunningly gorgeous as his daughter, and their relationship was touching. Brad Pitt was convincing as Death (grin) and as his dual personality, the sweetheart from the coffee shop. I love movies with a great ending, when the bad guy gets what is coming to him in a terrific climax. Meet Joe Black fits the bill. Ah, I think I'll have to pull this one out soon and enjoy it again. Disclaimer: there was no mention of God, or of a personal relationship with Him, and the film deserves its PG-13 rating due to adult content. It is also quite lengthy, so be sure to have some time on your hands if you choose to watch it. Tuesday: Thai Chicken Satays with Pita Bread. Wednesday: Company coming for lunch... salad and sandwich spread, veggies, fruit, chocolate chip cookies. Leftovers for dinner. Birthday party for dessert. Thursday: Grilled Chicken, Green Beans, Yams, Garlic Cheese Biscuits. There are not many ways to spend a more enjoyable evening than a girls' night out at a gorgeous renovated theater watching a movie as delightful as Miss Potter. It has been a very long time since I have had the opportunity to get out of the house for a relaxing evening. My sister, Shannon, called today to ask if I was up for a girl party. She and Mom invited me to join them at the movies. I was thrilled. Miss Potter was everything I hoped it would be. I laughed. I cried. I was inspired. I'll be spending the next few days revisiting Peter Rabbit, Jemima Puddle-Duck, Mrs. Tiggy-Winkle, and the rest of Miss Potter's friends. The stories and characters will have new meaning as I see them through the author's eyes. Renee Zellweger was excellent as the mischievous, spunky, heartfelt Beatrix. Emily Watson's character, Millie, was absolutely endearing. The scenery was breathtaking. The story, while achingly sad in the middle, was touching and well-told. Five stars! Thirteen years ago (1994), my sister and her husband bought a house as it was being built. They picked out carpeting, colors, and made some changes to the floor plan. That summer it was finished, and they moved in. And they invited me to move in with them and pay rent. Grin. I accepted, and soon I was living away from home (a long distance of four miles) for the first time in my life. I was 20. Less than a year later I met Russ, and we were married soon after that. I moved out just in time. My sister and her husband needed more space for their first child, born two months later. After Russ and I had been married for a year and a half, my sister and her little family moved out....and we moved in. The past ten years at our little 'cottage' have been amazing, full, and wonderful. We created an oasis in the back yard. We brought all three of our baby boys home from the hospital to this house. I get all choked up when I think about someone else owning it. Now it is time to move on. We have our 'forever house' in the country where we will create new memories and live a wonderful life. I hope the nice young couple who has purchased this house today will enjoy it as much as we did. If a boy asks, "What is a butter churn?" you'll have to explain how pioneers used to make butter. If you explain how pioneers used to make butter, he'll want to see a book with pictures. If you show him the book with pictures, he'll want to make his own butter. If he wants to make his own butter, you'll have to go to the grocery store to buy cream. If you go to the grocery store to buy cream, you'll have to find a jar in which to shake the cream. If you find the jar, you'll have to put the cream inside. If you put the cream inside, you'll shake and shake and shake (because boy gets tired after 30 seconds). If you shake and shake, you'll have a beautiful glob of homemade butter. If you have homemade butter, you must have hot homemade bread to put it on. If you're too tired and sick to make homemade bread (and have ripe bananas that need to be used), you'll decide to whip up a batch of banana bread. If you make banana bread and fresh butter, you'll be too tired to make dinner. If you are too tired to make dinner, you'll have to go out for pizza. Levi didn't think it was fair that I got to take all the pictures. He's not a bad photographer for a five-year-old! What he said: What a fool I am. Aren't you amazed? You can do as you please. Today is the worst day of my life (said while sitting on his floor, hands over his face, crying). What he did: (When he saw the movie, Charlotte's Web, that I had picked out for movie night) He fainted away onto the floor (with high-pitched sigh, and a smile on his face). Nope. No problem with comprehension here. 'I say, I wonder what's going to happen exciting today?' said Piglet. Pooh nodded thoughtfully. 'It's the same thing,' he said. We've been trying to get to the pool more often so that Levi and Luke can practice their swimming skills (and get out some energy). Leif and I decided to sit out this evening. Ilex, Drake, Holly, Levi, and I made it to another Shakespeare play. This time around we experienced an interpretive Twelfth Night. You just wait. In another year or two, we'll be Shakespeare experts! Russ was in the mood to get out of the house. We headed over to the Oregon coast and thoroughly enjoyed ourselves in spite of the drizzle. Levi has been begging to go camping ever since he and Dad had a 'boys only' camping trip in the mountains last summer. Now that we have a great 'wilderness' of our own, Russ bought a tent, set it up with Levi, went to the store to buy s'mores stuff, and built a bonfire. Levi and I were out (at the Shakespeare play) for the evening, but Russ invited Poppy over and roasted marshmallows with Luke and Leif while star gazing. When we returned, Levi and I joined the party and made ourselves some s'mores. A lightning and thunder show rounded off the evening as the boys made their nest in the tent. Leif and I again decided to sit this one out, but the big boys had a blast. They straggled out of the tent at 7:30 the next morning, greeted by a nice drizzling rain, and I whipped up a big batch of pancakes. Now that's the way to camp with three little boys. Grin. Answering small talk questions is one thing, answering them in only (and exactly) three words is something else. I copied these questions off Heather's blog, Becoming. We'll give them a try for our Saturday Small Talk. Where is your cell phone? On the couch. Your favorite item(s)? Books, camera, chocolate. Your dream last night? Didn’t sleep much. Your favorite drink? Icy Dr. Pepper. Your dream guy? My husband, Russ. The room you are in? The school room. Your fear? Severe child illness. What do you want to be in 10 years? Wife, mother, and teacher. Who did you hang out with last night? My crazy boys. What are you not? Extrovert, self-disciplined. Are you in love? Yes, of course. One of your wish list items? More house storage. What time is it? Quarter after four. The last thing you did? Fed a baby. What are you wearing? Denim skirt, shirt. Your favorite book? Count Monte Cristo. The last thing you ate? Pizza, Dr. Pepper. Your summer? Outside, gardening, camping. Your relationship status? Very happily married. What is on your TV screen? It is blank. When is the last time you laughed? Silly baby giggles. Last time you cried? Some sad movie. Your mood? Tired and fuzzy. Your friends? Sisters are wonderful! What are you thinking about right now? To-do list. Your car? Very dirty suburban. What are you doing at this moment? Blogging, parenting, thinking. Your life? More than imagined. Feel free to give it a try! Levi's grandparents (my parents), better known as Bambi and Poppy, have a special place in his heart. Bambi loves to read to him, and Levi loves to snuggle up on the couch. We are so very blessed to have them only two miles down the road (in my childhood home out in the country)! After reading The Well-Trained Mind by Dr. Susan Wise Bauer, I knew that classical education was the right learning model for our family. While I doubt we will be hard-core classicists, the neo-classical education spelled out in detail by Dr. Bauer is exactly what I want for my children. I will spare you the experience of reading my thoughts and knowledge on the subject (which would probably come out convoluted at best) and instead provide links which will give the reader a basic idea of classical education. One of the aspects I am most looking forward to is the four-year history rotation. If all goes according to plan, we will study ancient history in first grade, Medieval-early Renaissance in second, late Renaissance-early modern in third, and modern history in fourth. Hopefully, we will be able to repeat this journey through history two more times in the next eight years. I am thrilled that Susan Wise Bauer has written an engaging narrative of world history for elementary-aged students which is broken down into four volumes corresponding with each historical period. The Story of the World also has an activity guide with maps, coloring pages, review cards, book lists, and activities. After four years, I hope to finally have a solid grasp of history! I am also looking forward to covering Latin, logic, rhetoric, and the Great Books. When I have finished schooling all three boys through high school, I will be ready for anything! ...I went beyong the required curriculum in many of my lessons. For example, I taught my students how to add and subtract, but I also taught them that arithmetic is a Greek word meaning to count and that numbers were called digits after the Latin word digitus, meaning finger, because people used to count on their fingers. I taught them about Pythagoras, who believed that mathematics made a pupil perfect and ready to meet the gods. I told them what Socrates said about straight thinking leading to straight living. I read aloud to them from The Great Quotations and 101 Famous Poems. We talked about Emerson's "Self Reliance," Bacon's "On Education," and parts of Thoreau's Walden: "If a man does not keep pace with his companions, perhaps it is because he hears a different drummer." ...Until you reveal a larger world to children, they don't realize there is anything to reach for. The resources we are currently using. Pictures of our library/school room. Marva Collins' Way by Marva Collins and Civia Tamarkin has found its way to the top of my reading stack (after Russ snatched and read it), and I am thoroughly enjoying it. Even though I am only a short way through the book, I can feel that Marva Collins will have a strong impact on the way I teach my children. The subtitle, Returning to Excellence in Education, is very appropriate. Her advice will be highly appreciated. I didn't know anything about educational theory, and I have often thought that worked in my favor. Without preconceived ideas and not bound by rules, I was forced to deal with my students as individuals, to talk to them, listen to them, find out their needs. I wasn't trying to see how they fit into any learning patterns or educational models. I followed my instincts and taught according to what felt right. I brought my own experiences to the classroom, trying to figure out how I had learned as a student. I remembered what had bored me and what had interested me, which teachers I had liked and which ones I had disliked, and applied it all to my teaching. Not having any formal theory or textbook methodology to follow made me receptive to new ideas. I was constantly learning along with my students, always looking for new ways to make a lesson more exciting. The Marva Collins Story (1981) movie with Cicely Tyson and Morgan Freeman is waiting for me on my DVR. I can't wait to watch it after I finish the book. You can be sure I'll post more on the subject in the future. We'll see how well I follow my menu this week. I'm feeling uninspired for some reason. Maybe we'll just have chicken nuggets all week. Or not. We would like to wish everyone a Glorious Easter! April is National Garden Month. What a fun way to usher in the spring! This year will be a change for me as I say 'goodbye' to our little garden in the city and 'hello' to three acres in the country. Years were spent lovingly designing a charming landscape in our back yard, piece by piece. I know those roses by name; the plants and I share history together. Leaving them in the hands of someone else will be tough. The future at our new place is bright and sunny, however. Years from now we will have transformed this space into something that is truly ours. For now, it feels like a treasure hunt when I go outside and find something new blooming. If you would like some ideas for introducing children to the joy of gardening, try kidsgardening.org. 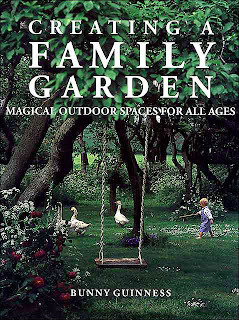 Creating a Family Garden by Bunny Guinness is a wonderful book with imaginative and practical ideas for creating a child-friendly garden. It doesn't matter if you have a small or large space, or prefer wild or manicured atmosphere. This book has something for everyone. I appreciate that the garden spaces are attractive to adults as well. Covering subjects such as tree houses, garden games, water gardens, wildlife and pets, and outdoor living, Bunny Guinness has created a masterpiece. My favorite design is 'The Wind in the Willows Garden,' complete with Ratty's river house. Although this design is a bit impractical for the average reader, most readers would be able to find inspiration or a few small projects to tackle within the cover of this book. For more garden fun, check out Garden project ideas from FamilyFun magazine, or the book Roots, Shoots, Buckets & Boots: Gardening Together with Children by Sharon Lovejoy. Not having much fine art exposure as a child or young adult, I am trying to make up for it now by (again) starting at the beginning with my boys. What exactly would be the beginning? I can't think of anything more simple than a board book. Julie Merberg and Suzanne Bober have created a board book series, each book representing works by an individual artist. The authors weave a simple rhymed story around a handful of paintings by the artist. I highly recommend these books as an introduction to fine art for children (and their parents). One of the first books I purchased in this series was A Magical Day with Matisse. The brightly colored paintings are perfect for sharing with a toddler, and yet the book also appeals to older children and adults. The Pianist and Checker Players immediately appealed to me. 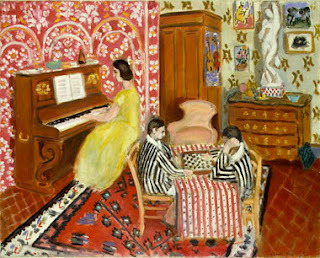 I loved the vivid colors, the way one of the checker players is resting his head on his hand while making a move, the idea of enjoying the evening playing games while someone plays a lively tune on the piano. This is one painting I would love to live in. Our local university invites the public to their lambing barns during the lambing season. We last attended a couple of years ago when Levi was three and Luke was a baby. Our timing was right on and we were able to watch a lamb being born. This year we visited right at the end of the season, and no birthing seemed imminent so we didn't hang around for a long time. Unfortunately, we are at the stage where we have to fit things in between feedings and nap times. Luckily for us, the day was gorgeous, and the country scenery was so peaceful. It's just nice to be out and about once in a while, ya know?